If you’re considering selling Oil and Gas royalties, carefully consider the following information! We’ll tell you everything you need to know about the value of oil and gas royalties in Marcellus Shale, or anywhere else in the United States for that matter. What is an Oil and Gas royalty interest? Before we dive into the value of oil and gas royalties, we need to explain exactly what royalties are. An oil and gas royalty interest entitles the owner to oil and gas production in a well equal to their royalty interest position. Once a well starts producing, the owner of the royalty interest will receive a royalty check each month for their share of the production. If you are receiving a check each month from the production of a well, you are receiving oil and gas royalties. What are my Oil and Gas royalties worth? The value of your oil and gas royalties will vary depending on a number of factors (discussed below) but we can still calculate and approximate value for selling royalties. To determine how much your royalties are worth, all you need to know is how much you receive each month on your royalty check. For example, if you receive a check for $1,000 each month, type $1,000 in to the calculator below. This will quickly show you that your royalties will likely sell for $48,000 to $72,000. That’s a big range isn’t it! So how do investors determine how much the value of your mineral rights are worth? Keep reading! Below are some of the factors that an investor will use to determine what they will pay for royalties. Keep in mind that each investor will have their own model for valuing your royalties. That’s why it’s important to shop your royalties around to as many buyers as possible so you get the best price! Well Life Cycle: Where the well is in it’s life cycle will have a significant impact on the value. If a well is newer (Less than 5 years old), there will be a sharp decline in the value during that 5 year period. This means the investor will determine their best guess about the value after the initial decline kicks in. In addition, an older well that’s nearing the end of it’s life cycle will obviously bring less than a well with many years of life remaining. An older well could bring as little as a few months of production if the well is about to become uneconomic. If you look at the picture below, you can easily see how the production starts off very high and then quickly declines in the first few years. 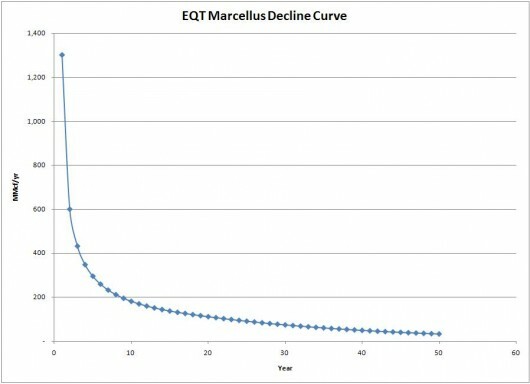 Over time it will settle at a lower rate (around 200 in the graph below) and then steadily decline over time. Oil vs Gas: A well that produces Oil will bring a higher price than a well that produces Gas. Oil prices are significantly higher than gas prices and investors put a premium on a well that produces Oil. Market Prices: The current market prices will play a significant role in the value of your royalties. If market prices are high, the value of your checks will increase because the production is worth more, meaning the value of your royalties will be higher. On the other hand, if market prices are low, you will be receiving less for the production so the value of your royalties will be lower. Surrounding Wells: The wells surrounding yours will have a big impact on what an investor pays even if those wells are no longer active. The reason is that these wells provide insight into the most likely scenario for your well. A savvy investor will check the closest wells around the well you receive royalties for and model their expectations from this information. Low Ball Offers: There’s no polite way to put it, some investors (many in fact!) will only offer 18 to 24 months production even when the value of royalties can be significantly higher. This works because owners get pressured to sell quickly and are told they are getting a “top dollar” offer. These investors don’t care about the factors that make your royalties worth more or less, they just want to pay the least amount possible. Do not rush when selling oil and gas royalties! One of the most important things to know about selling oil and gas royalties is that they are extremely easy to sell. Investors love oil and gas royalties because it automatically pays a return on their investment. If you’ve received an offer to sell your royalties, do NOT be pressured into selling quickly. If the buyer walks away there will be 10 more lining up the next day to make an offer. Royalties sales are very competitive which puts you in a powerful position to negotiate the best possible price. The best way to find out the true value of your royalties in the Marcellus Shale is to market your royalties online and let buyers compete for your property. By listing your property online you can market your property to entities that buy royalties from all over the country. The only way to know the true market value of royalties is to market them online and see what offers come in. We recommend US Mineral Exchange because they provide services specifically for the benefit of royalty owners. If you have royalties, fill out the form below. We are happy to answer your questions about royalties. Don’t be shy!